Sanetax is a new and unique service where a real Tax Professional prepares taxes with the convenience of online interaction. Sanetax helps Tax Agents in serving customers who don't want to visit the Tax Agents' office and who don't want to do their own taxes. Sanetax has developed mobile apps and web based CRM service to let you serve customers more efficiently. With Sanetax, you get more customers and increased customer loyalty. Convenience and time savings for both Tax Agents and customers. Free to sign up and use. We get paid only when you use optional invoicing within the CRM system. Start managing your customer contacts and communication from one place. Only $2 $0 per customer. This gives you unlimited SMS messages, unlimited number of customers, unlimited file storage and unlimited technical support. SMS customer support is still available as a premium option - for more information please refer here. 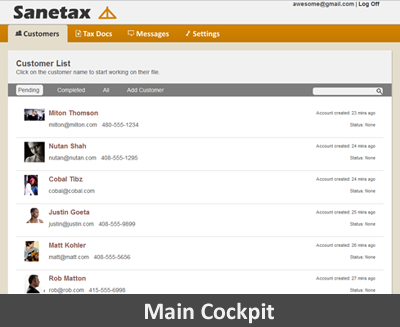 Get more customers by listing your business on Sanetax for free. Depending on your availability and work load, you can choose new customers. 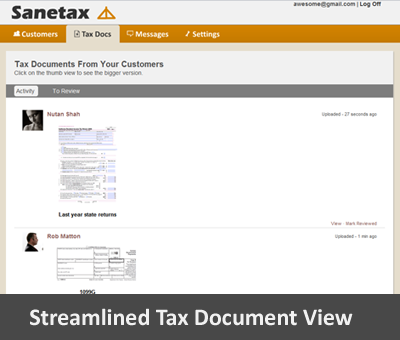 Handle the biggest bottleneck of getting customer tax documents faster. As customers themselves are going to take a picture(scan) their documents, you can avoid one extra step of scanning tax documents in your digital book keeping process. 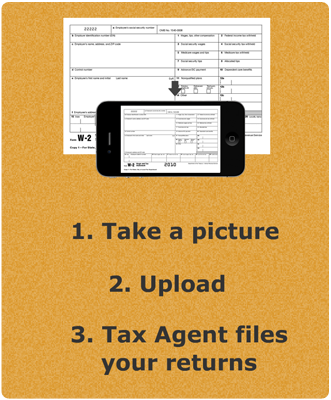 Your customers can upload W2 and other tax documents anytime and anywhere. This makes you prepare taxes according to your schedule. 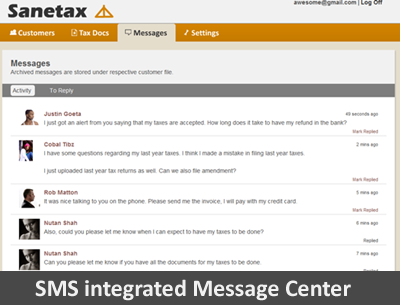 Using the Sanetax message center, all your communications are in one place. Send and receive SMS messages from customers staying right in the cockpit. Increase the efficiency by using message feed feature. You will never miss a customer question or request. Integrated invoicing is a snap. Customers can pay the fee right on their mobile devices or on a computer. You are in charge of your tax preparation fee. Refer FAQs for more information.